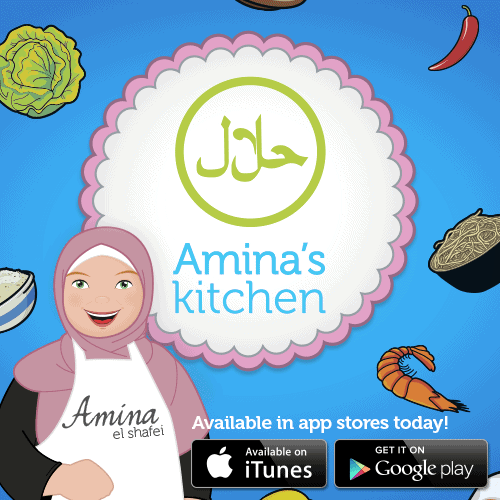 I have been excited about the Amina’s Kitchen App ever since I heard it was coming out. It’s exciting to see Islamic ideas and concepts come to fruition. And, yes, that is Amina from Masterchef! My son (cookie monster) enjoys the odd cooking app, he likes making burgers, serving ice cream and baking cupcakes. I thought this would be a great addition to our cooking app collection. First things first, the graphics are great, no fancy business, it’s simple, bright, eye-catching and perfect for children. Part of being involved in the learning of the game is needing to read, but it is not a necessity. The game has simple buttons with no clutter to confuse little eyes. It’s easy and clear to follow. In a simple and fun format the game teaches children what we can and can’t eat by having to collect the halal ingredients for the dish. This also teaches children about different ingredients and aspects that make up a meal. It would have been great if each dish had some element of cooking or adding ingredients together and included a picture of the dish, however I can see the aim is more on the education side of things. The inclusion of a map is a great feature. Your kids will be engrossed in a geography lesson without even knowing it. My cookie monster has recently become very intrigued by the idea that people come from different places and that we visit different places (ie. cities, countries), the app is great for reinforcing this concept (Peter Gould’s other app ‘Kids of the Ummah‘ also promotes this theme, cookie monster has mastered all the puzzles and loves clicking and colouring in all the kids). I think this app is probably aimed at a slightly older audience (i.e. older than my 3 yr old), but that’s not to say you need to be at a specific age to enjoy it, you could see the excitement in the cookie monster’s face as he screamed, “No. No. Yes. Yes. Not that one. Yup! Yup!”, when trying to fill the baskets. My 11 yr old sister in law did feel a little old for the game, although she enjoyed it. I would pin it between 3 and 10 as an ideal age group. I had fun with it myself while testing it out, if I hadn’t checked the time, who knows how long I would have been playing for. I’ll admit this app has a slightly hefty price tag, but I think it’s very important to support Muslim projects and endeavours. It may not be perfect, but worth every cent in the hope for furthering future ideas such as these. In fact if I had seen the project on LaunchGood in time, I would have pledged. All in all I’d say it’s a great app, it may not be for us right at this moment but will definitely be one we will re-visit in the near future.